Home Skin, Hair and Nails How long does Sunburn Last? If you’ve been out in the sun for too long, you may find yourself wondering and worrying about how long your sunburn will last. This article offers insight on the ways you can recover from the peeling, swelling and pain of sunburn, and lets you know just how long sunburn can last. How Long can Sunburn Last? Before you can learn how long it takes your body to recover from sunburn, you need to know what sunburn does to your body. You are most likely to develop sunburn from spending more time than you should exposing your body to the ultraviolet rays of the sun or tanning devices. Sunburn, of course, may affect anyone who spends a good deal of time outside on sunny days (or even cloudy days), without proper SPF protection from creams or long sleeves, long pants and protection for your eyes and face. If you have fair skin, you will be more vulnerable to becoming burned by the sun, when compared to someone who has naturally dark skin. Fair skin does not have as much melanin within it, as compared to darker skin, like that of African American persons. Melanin is the substance that will provide your skin with protection from the dangerous effects of the sun and other irritants. UV rays can pass from the sun through clouds, to burn your skin. In fact, clouds can even reflect UV rays, causing more skin damage. If you’re lying on a beach on the ocean, the cooling breeze also plays a part in how severe your sunburn may become. You may not feel it as soon as you ordinarily would, since the breeze cools you. Sun intensity can cause mild sunburn, moderate, severe or even lifetime sunburn. Spending time in the sun during the hours when its rays are strongest – usually between 10 am and 3 pm – can lead to severe sunburn. The intensity is very strong during these hours, regardless of whether it’s sunny or cloudy. If you have only mild sunburn, it may last for just three or four days. The symptoms you experience may be mild, basically just low level pain and redness on the areas affected. Mild sunburn won’t normally upset your daily school or work schedule. After a few days, your skin begins the development of new cells, and then the dead cells will peel away. Moderate sunburns last longer than mild ones, of course. They may take about a week or a bit longer to fully heal. This sunburn level involves more redness and pain than mild sunburns. You may want to take OTC medications for the pain. Cool compresses help and Aloe Vera gel is cooling and effective in relieving pain. These treatments will shorten the length of time the pain lasts. This level of sunburn can be life-threatening. Visit your physician right away for swift treatment. Sunburn that is at the severe level may last for a few weeks. You may experience not only redness and burning, but also blistering, dehydration, chills, nausea, fever and headache. You may well miss some of your daily work or school schedule, especially if you must be hospitalized. This is not often talked about when asking, “How long does sunburn last?” In this case, the answer can be literally a lifetime. If you have more than a few episodes of severe sunburn, it can cause permanent damage. It also can lead to other conditions of the skin, like age spots and wrinkles. Multiple instances of severe sunburn, whether you have fair or dark skin, will allow the sun’s UV rays to penetrate your skin. This will damage your inner skin tissues, and can lead to skin cancer. You can enjoy the outdoors without risking your skin and your health. Use protecting clothing, sunglasses, hats and sunscreens to guard against the harmful UV rays of the sun. How long does the Swelling of Sunburn last? Sunburn can certainly cause swelling. Any area that was exposed can become swollen. With mild sunburn, the swelling may disappear in two or three days. If you have severe sunburn that causes swelling, it can last for two weeks or so. First aid measures and treatments will be helpful in reducing the time it takes for sunburn swelling to abate. Drink lots of water and use cold compresses on the areas affected to reduce the time needed for healing. You can also take a cool or cold bath or shower to get rid of some excessive body heat. Apply a vitamin E moisturizer or Aloe Vera gel to help in repairing the damaged skin. This will reduce the length of time the swelling lasts. Swellings from severe sunburn may cause stronger pain and blisters that may last for weeks. Medical attention may be needed. OTC pain killers will help with pain relief. The swelling from sunburn is the visible damage of UV rays to the skin. 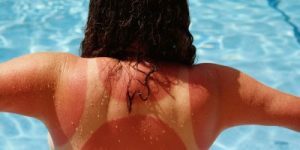 Several severe sunburns may lead to lifetime skin damage. This includes premature skin aging and even skin cancer. Minimize the amount of time you are outside, especially in the strongest sun hours of 10 am to 3 pm. Before you go outdoors, apply a sunscreen. Reapply it every two hours while you’re out. How long can Sunburn Rash last? Sunburn rashes develop from too much sun exposure. They may occur anywhere on your skin. They develop after several hours of sun exposure. They may only affect your skin for several days if you have protected yourself with proper clothing and sunscreens. Sunburn rash is more commonly seen on fair skin, but it can occur on any type of skin. Fair skin is naturally more sensitive to the rays of the sun. The rash includes itchy little bumps that leave your skin uncomfortable. Sunburn rashes develop mostly on the face, scalp, neck, back, chest, legs and arms. Home remedies for rash may be helpful in reducing the length of time the rash continues to be a problem. If you apply a cool compress on the affected skin, and apply Aloe Vera gel, it soothes your skin rash and relieves pain. Sunburn rash is especially uncommon in people who are in their 40s or 50s. By this age, the skin is tougher and can resist some rashes. You can prevent most sunburn rash by avoiding any overexposure to the sun. Properly apply sunscreens – 50 SPF or higher is great – to give your skin maximum protection from those UV rays. According to Livestrong.com, protective clothing, hats and sunglasses are also important when spending a long time outside, especially if it’s sunny. Don’t forget you can also get sunburn on cloudy days if you’re out for many hours. How long does peeling from Sunburn last? After your skin is exposed to the sun or tanning devices, your skin will begin to redden and pain will develop within a half hour or less. The burn continues for one or two days, until your skin begins to heal. Then the peeling will last about three to eight days. The peeling from sunburn occurs on the most affected parts, usually including the lips, neck, face, hands and chest. The damaged and dead skin cells shield the new cells that begin growing. Once the new skin has formed, the dead skin will begin peeling. When you peel dead skin, be gentle. Don’t pull a lot on the skin, or you may remove new cells. New skin cells are very delicate and are easily damaged. Lukewarm baths will soften those dying skin cells. Use soft, clean washcloths to peel dead skin. Don’t rub the skin or treat it roughly. Apply a good moisturizer after you dry off following a shower. Aloe Vera will moisturize and soothe your skin, too. Protect your skin if you need to go outdoors again. How long does the Pain of Sunburn last? Sunburn affects many people, especially during the summer months. However, this doesn’t mean you can’t get sunburned in colder months, especially if the sun is out and there is snow on the ground. The duration of the pain will depend on the type of sunburn you experience, your complexion, and how you treat it. Depending on how long you spend outdoors, the sunburn pain can be gone after six to 48 hours. You can use NSAIDs like aspirin and ibuprofen to alleviate some of the pain from sunburn. Medications like these may lower the amount of time your pain will last. Home remedies may also be helpful in decreasing sunburn pain severity, and reducing the time it lasts. Apply cool compresses to remove excess heat. Vinegar may take away some of sunburn’s sting, too. Just dip a cotton ball into it and dab the vinegar on the areas affected. Aloe Vera may be helpful for the superficial pain.